Windows 10 S is a specific configuration of Windows 10 Pro that offers a familiar, productive Windows experience that’s streamlined for security and performance. Windows 10 S will only run software that is vetted to be safe. It will provide enterprise grade protection from threats on the Internet and in the Cloud. Macros automate frequently-used tasks; many are created with VBA and are written by software developers. 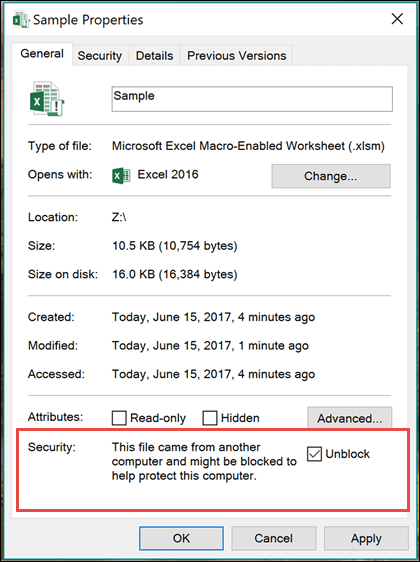 However, some macros pose a potential security risk. It's important to know that you don't have to enable macros in order to view or edit the document. However, if you want the macro functionality, you can unblock the file in question. To do this you will have to have saved the file you want to unblock to a local hard drive or OneDrive. Open Windows File Explorer and find the file that you want to unblock. Right-click the file and choose Properties from the context menu. At the bottom of the General tab you should see a section for Security. Select the Unblock checkbox. The file should then be accessible from there normally. This article was last updated on June 15th, 2017 as a result of your comments. If you found it helpful, and especially if you didn't, please use the feedback controls below to let us know how we can make it better.